Chris, Juliana, Ben and Riki Graves. 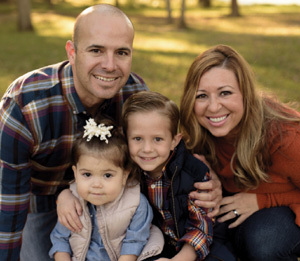 In 2012, Riki Graves completed her Masters in Health Care Administration, and she and her husband, Chris, a Major in the Texas Army National Guard, and one-year-old son, Ben, moved to Brownwood, Texas. Riki taught LES MILLS BODYPUMP™ and BODYFLOW™ fitness classes at a local gym and loved motivating others. But, circumstances quickly changed. In August 2013, Riki received the wonderful news that she was pregnant. They were thrilled and began preparing for a second child. A month later, Riki was diagnosed with breast cancer and referred to MD Anderson. In October, she underwent surgery, but lab results showed that she had an aggressive cancer, so she would need lymph nodes removed, as well as chemotherapy. “I went back to work after the news, sat in my office and cried,” said Riki. “I didn’t want to have chemotherapy. I could not in good conscience poison my body while I was pregnant. I didn’t want it to impact my baby.” So, she decided to forgo the chemotherapy. At Riki’s 20-week OB/GYN appointment, the doctor discovered that her baby had a heart issue, so she was referred to a fetal cardiologist. The diagnosis was hypoplastic left heart syndrome (HLHS), a birth defect that affects normal blood flow through the heart. Riki underwent additional surgery to remove 16 lymph nodes but refused the chemotherapy. She and Chris named their unborn child Juliana Eileen Graves and prepared for battle. Juliana Graves in April 2014 before transplant. On March 28, 2014, Riki was admitted to the hospital; Juliana was in heart failure. An emergency C-section was performed on April 9th, and Juliana was born weighing 6 pounds, 14 ounces. Juliana was immediately whisked away to 24-hour monitoring. Chris stayed all night with Juliana, so Riki was left alone. The next day, the Chief of Congenital Heart Surgery at Texas Children’s Hospital met with Chris and Riki and said that Juliana was not a candidate for corrective heart surgery. 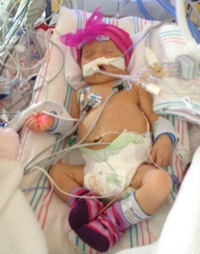 They could try to get on the transplant list, but chances of getting a baby heart were slim. They were devastated and began the process to put Juliana on the heart transplant candidate list. Soon after Juliana was listed, an infant heart became available. At 17 days old, they began Juliana’s high-risk surgery. Once completed, her new heart started beating immediately. It was a miracle. Today, Juliana must stay on anti-rejection medicine and avoid exposure to people who have not been immunized. She has been hospitalized multiple times but gets stronger every day. Juliana just celebrated her third birthday and is doing incredibly well. She is active, high-spirited and a joy. Her brother, Ben, has been an integral part of Juliana’s development and therapy sessions, so they are very close. Had Riki opted to do the chemotherapy, Juliana’s chance at survival would have been very slim. Riki is grateful that she had the courage to deny the treatment in order to save her daughter. “Because Juliana’s story is so inspirational, Texas Children’s Hospital shares it regularly. I share it to promote fundraising for Texas Children’s Hospital and advocate the importance of organ donation and children’s vaccinations,” said Riki. Juliana could easily contract a life-threatening disease, because she cannot have live vaccines. She must depend on children around her being vaccinated. Juliana and children like her cannot attend a school where fewer than 95 percent of the children are vaccinated. Through her experience, Riki has become very passionate about educating people on the importance of childhood vaccinations. She now works for Texas Children’s Hospital and advocates for vaccinating children in Texas to reduce the risk for children like Juliana. Recently, Riki wrote to the parents of the child whose heart now beats in Juliana. She thanked them for the life gift they gave and shared how Juliana is thriving as a healthy three-year-old. She also told them that she advocates for organ donations and vaccines to honor their child, as well as Juliana.